>> Boring Like A Drill. A Blog. Experimental music can behave like a wildfire. If the conditions are sufficient (dry enough, hot enough, with enough material to burn) it will spread with very little encouragement. The “environmental” conditions in this relatively small world can be improved by the actions of a few people. Dryness might mean: a need to escape from a particular musical dead end, a looming sense of crisis. Heat might mean: people coming together. At times the energy of such groupings (of artists who are in constant close contact, helping and disagreeing) is hard to take, but it is, for those who have experienced it, a very real and combustible force. Material might mean: musical ideas that are both profound and unfinished, such as those left behind by Cage and still actively pursued by the composers of the generation following, including, of course James Tenney. Jim Tenney had a deep, intuitive sense of this. By the time I met him finally in 2000 (when we started teaching at the California Institute of the Arts together) he was also an experienced hand. It was somehow clear to him that the desert near Valencia was both dry and hot enough. Thanks mostly to Jim, the students started coming – not in huge numbers, but enough to form groupings. I knew something about wildfires from my experience with Wandelweiser – and did my best to bring some of that material together with the talented people who started to appear. Hardly anything needed to be explained. This group, like several that followed, seemed to know right away that what was happening there might be of use to them, at the very least, as kindling, and sometimes much more than that. Strange, strong, and diverse, no one would tie the group of relatively young composers represented on this recording together, based on surface similarity or, God knows, agreement. But they are together and part of a much larger group. The very beautiful, heartfelt recordings here are some evidence that this fire spread, that it continues to seek out places to burn. Jim would be proud of these people, and I am moved and encouraged by their music. the roots of this cd date back to 2011 when the assembled musicians started to think about a possible contribution for the upcoming centennial of john cage’s birth. we soon came to the conclusion that we were more interested in searching for relevant traits of his experimental thought amongst younger composers rather than perform anything by cage himself. in 2007, during a teaching stint at the california institute of the arts, i encountered an active scene of young composers in los angeles (cage’s birthplace after all) who subscribed to an experimental approach to music. the presence of james tenney (until his death in 2006) and michael pisaro, both of whom were teaching at calarts, was certainly seminal for the creation of this scene. almost all of the composers presented herein have studied with either one or, in certain cases, both of them. they form a loose group with varying interests, maintaining an online publication called "the experimental music yearbook", which is a billboard for relevant information as well as a repository for scores. often they flock to "the wulf. 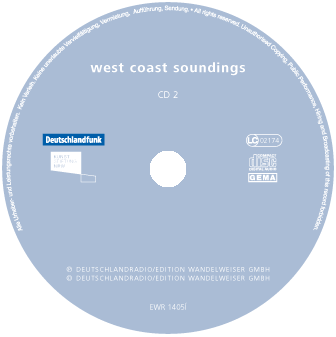 ", a venue for experimental music run by some of those represented on this cd. their musical interests range from the exploration of tuning (lamb), to complex mathematical graphs and game theory (winter), the use of dry ice to sound triangles (mooney) and to the radio-receiver as a sole sound source (anderson). accentuating the tonal content of field recordings forms the core of wada’s piece, while kallmyer invites the performers to follow the course of a river as a score. steenberge takes us through a twisted waltz, closer to satie’s paris than strauss’s vienna and tolimieri constructs a trio from melodic fragments and heterophonic ambiguities. cazan’s conceptual strategy employs a computer, gradually reducing available pitches by filtering out ones that have been heard, and so asks that the musicians gently play "independently, alongside a spoken reading of the poem". the pieces by tenney and pisaro are classics in their genre and have been covered elsewhere already; however, i hear aspects of them resonating through some of the other pieces.